(Newser) – Is French designer Balenciaga making fun of its wealthy clients, or does it just know a thing or two about brand loyalty? Whatever the case, the Sun reports the fashion house is selling a mock white paper shopping bag for £876, which works out to roughly $1,110, and it's so popular it's sold out on Colette. 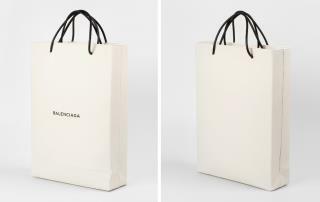 It looks just like the free paper bags Balenciaga gives patrons their purchases in, only this one is made from calfskin and costs just a touch more. Some rich people aren't very smart. Fabulous. I can't Wait to buy 5 of them with my Republican TAX BREAKS HAAAAAAAHAHAHA!